We have had a trying ten days with only intermittent internet and phone services while Turk Telekom installed new cables in our village, no service at all for several days, in fact. With limited opportunity to waste time on the internet, it has surprised me just how many jobs I’ve been getting done in the house. Not to mention plenty of beach time. We spent a couple of days in Fethiye this week, our main project being to visit our favourite dried fruit stall on the fantastic Tuesday food market. The man who owns the stall keeps a stash of glacé cherries ‘under the counter’ for his favourite customers and he happily lets us endlessly sample his produce while he bags up whatever goodies we have picked out. I now have everything required to make mincemeat for us and a Dundee cake to leave with our friend John in lieu of the Christmas cake I normally make for him. He’s not getting one this year, because I could not be fagged to lug marzipan and fondant icing in my suitcase, and both ground almonds and white icing sugar are non-existent here – Turkish icing sugar is a strange shade of pink from the vanilla that is added to it, and I just can’t bring myself to have Santa and Rudolf wallowing in a pink snow scene. 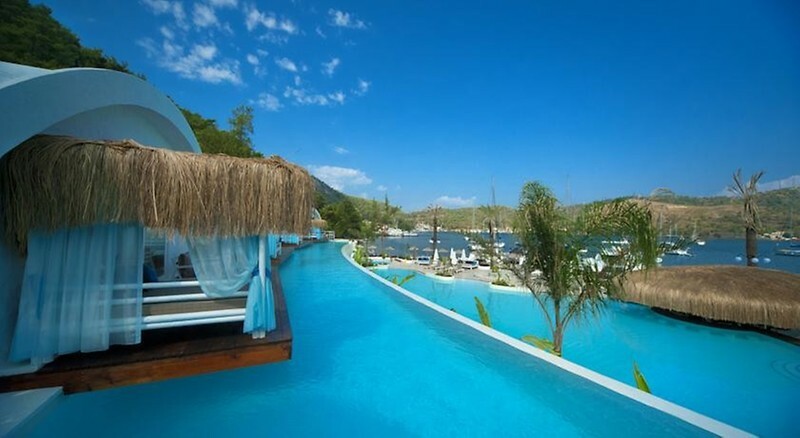 We checked ourselves into our new favourite hotel in Fethiye, being utter cheapskates and having booked the cheapest rooms available, with no sea view. To our surprise and delight, they upgraded us to the best rooms in the house – two of their absolutely gorgeous water villas, which have huge sea-facing decks, complete with day bed and steps into a private lap-pool shared only by the five suites. Unfortunately, despite our late warm weather, the water is freezing now, so we didn’t actually swim, but we managed a toe-dangle while we drank tea on our deck and made the most of the gorgeous view across the bay towards the islands. Anyway, I digress. Back to the jam making. My friend Mela is visiting from Canada, and she brought me a lovely gift – an out-of-print 1967 book of American preserving recipes. I have been trying out the lime marmalade recipe to see whether it is any different to my usual one. It is made in stages, over three days, though each stage only takes a few minutes. I haven’t sampled it yet – today is day three and the marmalade is still warm (not that this has ever stopped me before), but I will report back to you in due course. Prompted by an entry in the book, today’s other effort has been quince jam. I love the taste of cooked quince (it is inedibly sour and chewy in its raw state), but have never actually found a quince jam here that I like. There is a large quince tree overhanging the road just across from our house, so I snaffled some fallers that hadn’t been squashed by the passing traffic, then scoured loads of recipes on the web, eventually cobbling together what seemed to be the best bits of each one. Some suggested leaving the peel on (I urge you not to do this), some grating the flesh, others cooking it in large chunks, then mashing the cooked quince with a potato masher. One recipe suggests cooking the cores first to extract the pectin (which is what makes the jam set), so I started with that, but also added the peel, beneath which a great deal of the natural pectin lies. I can’t say it has been a quick job, as both the cores and then the fruit have to be simmered for quite a long time, but most of the time you can just leave it to do its own thing (while you waste time on the newly-reconnected internet and/or spend a frustrating two hours trying to get your new printer to talk to both the router and the various devices in your household). The final boiling of the jam only took a few minutes and the colour of the finished article is absolutely gorgeous. I’ve no idea what makes the fruit and its cooking liquid change colour from dubious murky beige to brilliant amber, but it is certainly one of Mother Nature’s more endearing little tricks. If you can get your hands on some quinces and don’t want to make jam, the Turks also make them into a wonderful pudding, which is just called ayvı tatlısı (quince dessert). This is traditionally served generously adorned with slices of thick buffalo clotted cream and topped with pistachios. No calories there then. If you want to give it a go, this website has a great recipe for this and for many other Turkish dishes. Enough rambling and on to the recipe. My three large quinces weighed about 800g before I peeled and cored them, and I ended up with three normal supermarket-size jam pots. Next time I will definitely make double the quantity, as I have several eager friends waiting in the wings to sample this, so I am guessing that much of it is leaving the house without me. You will need warm jam jars sterilised either by washing in hot soapy water, rinsed well and put in a 100ºC oven for ten minutes, or washed on a hot cycle in the dishwasher and used while still very hot. Add the jam while the jars are hot, or the glass may crack. Fill a large bowl with cold water and add the juice of one of the lemons. Measure 1 litre of water into a medium-sized saucepan – large enough to take the water and the quince cores and peel with plenty of room to spare. Put a saucer or small plate into the freezer – this is for testing the set of the jam later. Peel, quarter and core the quinces. Put the cores and peel into the saucepan. Cut the quince quarters in half lengthways, then slice thinly. Put the sliced quince into the bowl of lemon water as you go (this helps to stop it browning, though it will still probably brown a little). Bring the saucepan with the 1 litre of water and the cores and peel to the boil, then simmer very gently, uncovered, for about an hour. Strain the cooking liquid into a jug and discard the cores and peel. Put the reserved cooking liquid into a large saucepan, along with the sugar and fruit (the pan needs to hold at least twice the volume of your fruit, sugar and liquid, or the jam may boil over). Heat over a medium flame until the sugar has completely dissolved, then you can turn up the heat a little while you bring the mixture to the boil. Once the liquid is boiling, give it a stir, then turn down to a low heat, so that the mixture is only just very gently simmering, and leave for about 1 hour, 15 minutes (do not cover with a lid). The colour will gradually change from murky beige to amber. The fruit should now be very soft and you should be able to squash it quite easily with a potato masher. If you prefer your fruit to be left in whole pieces, by all means omit this stage. Once the fruit is the texture you like, bring the mixture to the boil again, then cook over a medium heat for around 10 minutes – it should be simmering steadily but not boiling and splashing in a ferocious way, or the jam may catch on the saucepan and burn. If you have a probe thermometer, you are looking for a temperature of 105 degrees centigrade. Otherwise, wait for the liquid to become a thick syrupy texture. Test by spreading a teaspoon of the jam across your cold plate and pushing it with your finger. If the surface wrinkles a little when pushed, it is ready – if not, cook for another three or four minutes, then test again. Once your jam is ready, ladle into a heat-proof jug and pour into your hot, sterilised jars. The jam is delicious piled on to buttered fresh bread or dolloped onto thick yoghurt. Posted on November 17, 2018 November 18, 2018 by JaynePosted in Egg and/or dairy free, gluten-free, Jams, chutneys & other preserves, Vegan, VegetarianTagged ayvi receli, ayvi tatlisi, jam, preserves, quince, quince jam, quince marmalade, Turkey.